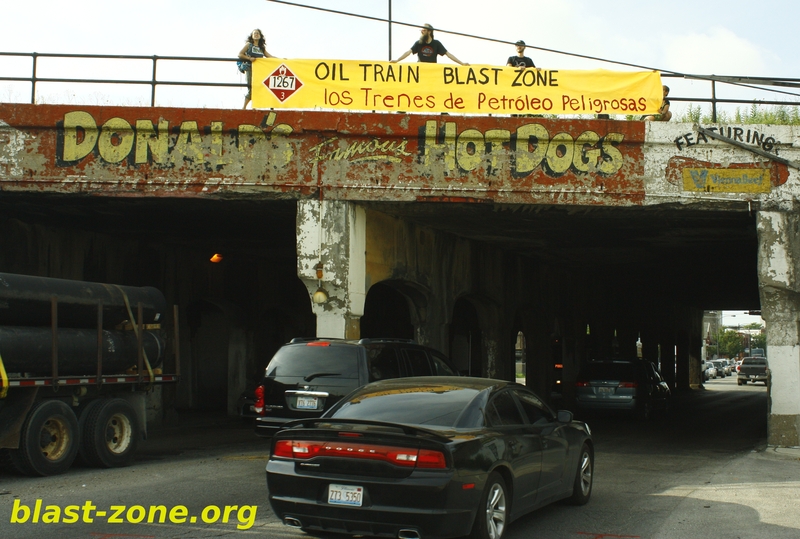 CHICAGO, IL – Tuesday, a giant 25 ft banner that had the words “Oil Train Blast Zone” was held on the rail overpass and Burlington Northern Santa Fe (BNSF) rail yard at 18th and Western in Chicago’s Pilsen neighborhood to greet morning commuters and raise awareness about the threat that oil trains otherwise known as “bomb trains” cause. This action was part of a week of action and awareness to stop these dangerous trains. The week of action is timed with the 3 year anniversary of the Lac Megantic oil train derailment and explosion that killed 47 people in a small town in Quebec. The week of action was initiated by STAND. Chicago, with 40 oil trains per week, has more oil train traffic than any other city. Burlington Northern Santa Fe (BNSF) transports the oil from the Bakken oil patch, where it is extracted by a process called hydraulic fracturing or fracking. The fracked oil contains methane and it’s so explosive because it is put into rail cars without de-gasifying it. There have been 14 major oil train explosions during the past 3 years alone. In response to these explosions stronger oil cars are now being used but a March 2015 derailment and explosion in Galena, IL was with the newer, stronger 1232 tank cars. The oil train that exploded in Galena was headed for Chicago. Members of Rising Tide Chicago that live near the rail line and in the blast zone organized and participated in this action. This banner drop was part of an ongoing campaign to organize communities in the blast zone to stop oil trains and transition to clean, safe, community control energy. ← Invenergy CEO Home Demo: No Fracked Gas Plant!